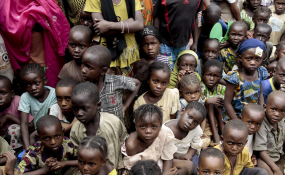 Internally displaced children in Bangui, Central African Republic. The government of the Central African Republic and 14 of the most powerful armed groups operating in the country came together to sign a peace deal last month. If it goes to plan, the signatories will be responsible for leading the country into a new era of peace, allowing its incredible potential to blossom. However, failure will further solidify CAR's place as one of the world's most fractured states. Conflict in CAR - rooted in a series of ethnic, socio-economic, and geographic cleavages - has raged with waves of intensity since 2012, displacing millions of civilians and enabling countless crimes against humanity. Despite committing an untold number of atrocities, the country's armed groups have up until now offered the best chance of representation for much of the population that has long remained on the margins of political life. A successful transition will create a more representative government and secure a peaceful path forward. The Political Agreement for Peace and Reconciliation, signed in Khartoum in February, lays out a series of actions that the government, armed groups, and international and regional partners must undertake to fortify a lasting settlement. But to ensure its long-term success, involved parties should exercise caution when dealing with the most fragile of these issues, including the creation of a truth and justice commission, the use of amnesty and impunity, and the formation of an inclusive government. One of the most powerful critiques of the recent agreement is its failure to build off the 2015 Bangui Forum, which represented a much broader cross-section of Central Africans. While ultimately unsuccessful, the Bangui Forum more fully addressed issues of justice and reconciliation with much more input from victims and victim advocates than the current agreement. The pursuit of justice in the wake of conflict and human rights abuses, like those experienced by Central Africans, is critical to building a lasting peace. In order to facilitate the implementation of justice, the government is responsible for establishing a Commission on Truth, Justice, Reparation, and Reconciliation. This commission will seek to identify all victims of the conflict and to form a working group focusing on how best to preserve peace and find justice. In a post-conflict environment, justice can sometimes be given a lower priority in the face of the myriad pressures facing the peace process. This is even more likely in countries like CAR, given the extreme complexity of conflict dynamics, issues of territorial control, and long history of atrocities. But failure to give justice its due would cause untold damage to the psyche of the country while increasing the chance for violence to escalate again in the near future. That's why CAR's government must also continue educating its citizens on the terms of the agreement. It is important that Central Africans understand and agree with the terms, as an engaged public will contribute to its success. Additionally, citizen support of the agreement will strengthen democracy and build support for the government. While the agreement recognises that impunity has contributed to the cycles of violence experienced by CAR, and even though it does not deliver general amnesty nor offer impunity to any armed group members, major concerns remain. One of the more problematic clauses of the agreement gives President Faustin-Archange Touadéra the power to grant amnesty in addition to his established ability to pardon convicted individuals. So, while not expressed in the agreement itself, there is still an opportunity for those who have committed acts of war to remain free from justice. Amnesty is the issue with the greatest potential to derail the agreement. If Touadéra is to grant amnesty to any members of armed groups, he should do so only as a last resort, and with the understanding that this action revictimizes his own citizens. Amnesty should not be given lightly and must be discussed in-depth and with guidance from the AU and the UN. If these powers are over-exploited to protect armed group members from justice, then war will inevitably return to the country. It is also important to continue building judicial capacity in CAR. The delivery of justice will depend a great deal on local and prefecture courts. With assistance from outside partners, CAR has made great strides in strengthening the judiciary over the last years, and these efforts must continue. Finally, international organisations who have a long history of prematurely moving on from crises in CAR, must do more. The people of the country deserve better than to be forgotten once again. Regional and international observers have hailed the agreement as a step toward a final peace. But less than a month after the agreement was signed, uncertainty emerged. Early in March, the CAR government published a list of new ministerial appointments with several new appointees coming from within the ranks of the armed groups. However, the government was keen to avoid undermining President Touadéra and his allies and selectively left out several groups. Acting against what they perceive as Touadéra failing to adhere to the terms of the agreements, several of the armed groups have taken action, including recalling their representatives and blocking a road in the west of the country. If the CAR government does not address this situation, it is unlikely that the agreement will move forward. If, however, the CAR government capitulates, it will have set a new pace for future negotiations. The current situation shows the precarious balance of bringing armed groups into the political fold while simultaneously protecting the interests of entrenched political actors. One of the most important actions for creating political inclusivity will be the transformation of armed groups into effective and legitimate political parties. The previous election, held in 2016, was the first democratic election in CAR since 1993. The next election will start in late 2020 and, in order to participate, these groups must meet agreed-upon standards. Peace is within grasp for the first time in many years. However, if participants and observers act recklessly, the numerous vulnerabilities could spell the undoing of the current agreement and lead to a resurgence of conflict in CAR. Read the original article on IRIN. Copyright © 2019 IRIN. All rights reserved. Distributed by AllAfrica Global Media (allAfrica.com). To contact the copyright holder directly for corrections — or for permission to republish or make other authorized use of this material, click here. Will the Latest CAR Peace Deal Hold? CAR Civilian Deaths a Precursor to Wider Regional Violence? Can Convicted Bemba Run for President in DR Congo? Congo-Kinshasa: To Stop Ebola, Ask the Rebels to Help! Africa: What Effect Did the U.S. Shutdown Have On Foreign Aid?